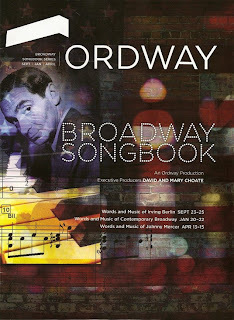 This season the Ordway is doing a new series called Broadway Songbook, all about the music of Broadway - my favorite thing! The first selection featured the music of one of the greatest American composers, Irving Berlin. Even though I haven't seen very many of his shows or movies (he composed for both the stage and screen), I knew most of the songs in the program because his music is so ingrained in popular culture. This is the second Irving Berlin themed musical event I've attended this year; his early immigrant experience was featured in Theater Latte Da's Steerage Song this summer. 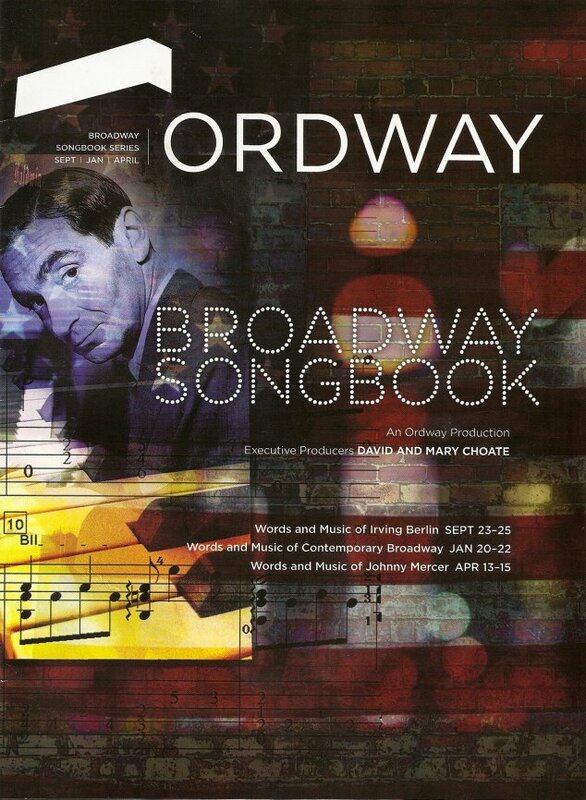 The music of Irving Berlin was brought to life by the narration of James Rocco (Artistic Director of the Ordway), piano accompaniment by Raymond Berg, and four talented singers. Actually, to call them "singers" is selling them short. They're all accomplished musical theater actors who really brought the songs to life. The wonderful thing about Berlin's music is that even songs that were not written for musical theater tell a story, making them perfect for a musical theater cabaret like this. The cast included Joel Liestman, who's made frequent appearances in Ordway productions, including last year's super fun Joseph and the Amazing Technicolor Dreamcoat. I think I first saw Robb McKindles as Leo Bloom in The Producers at the Chanhassen a few years ago, and most recently as a tap-dancing* sailor on the H.M.S. Pinafore at the Guthrie. I still remember Kersten Rodau as half of the conjoined Hilton sisters in Side Show at Park Square almost ten years ago (she'll be appearing there again in Ragtime in January), and she also appeared in Pinafore this summer, as a fabulously dressed sister/cousin/aunt. I don't recall seeing Maria Stukey before, although she's appeared at the Chan a few times, but I'll be sure to take note next time she's in a show. The music was arranged more or less chronologically, with James leading the audience through Berlin's life, from his days as an immigrant child, to his first hit song ("Alexander's Ragtime Band"), to his stint in the army during World War II which led to a couple of musicals written for all soldier casts, to his popularity as a composer in Hollywood. Highlights include the Joel's beautiful version of the ballad "How Deep as the Ocean" (written shortly after Berlin's first wife died on their honeymoon), Kersten's gorgeous "Always," Robb's rousing "Let Me Sing and I'm Happy," and Maria singing the often cut "Mr. Monotony." That seemed to be a theme; Berlin would write a song for one show only to cut it, and resurrect it years later. Such as the failed song "Smile and Show Me Your Dimple," which later became the hit "Easter Parade." Another uber-popular holiday song is, of course, "White Christmas." Robb sat down on the edge of the stage to sing it, and then led the audience in a sing-along. That song evokes such a sense of nostalgia; it's a beautiful thing. Another song from the movie White Christmas was featured when Kersten and Maria dueted on one of my favorites from the movie, "Sisters." The cast sang a medley of songs from Irving Berlin's most popular stage musical, Annie Get Your Gun, which sadly I've never seen. Perhaps some local musical theater company should do a production of it, and soon. Kersten has my vote to play Annie for her convincing performance of "You Can't Get a Man with a Gun," as well as beating Joel at the playful competition song "Anything You Can Do." Robb can join her in the cast; his performance of "They Say It's Wonderful" was heart-breaking. This was a wonderful afternoon of musical theater; I learned some things I didn't know, and heard some new songs along with old favorites. I'm really looking forward to the next selection in the Broadway Songbook series - The Words and Music of Contemporary Broadway in January. That's right up my alley, and I'm sure it will again feature great local musical theater talent. *Robb is teaching a ten-week tap-dancing class at the Guthrie this fall, for beginners and experienced tappers, which I find extremely tempting. But I'm not sure I'm up to the commitment of being in downtown Minneapolis by 10 am every Sunday for 10 weeks. But it sounds like a lot of fun!